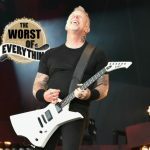 Metallica appeared on Jimmy Kimmel Live last night – the place they performed live and took on a superfan in a quiz about Metallica. The thrash icons performed their classic song For Whom The Bell Tolls and then faced superfan Dave in a quiz known as Who Knows Metallica? Metallica also mentioned their new, number one album Hardwired… To Self-Destruct and how their iconic band logo was created. On the Metallica’s logo, Lars Ulrich revealed that frontman James Hetfield came up with it. Hetfield says: “On a napkin. 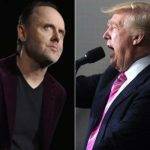 When we were thinking up Metallica and what dream we wanted and how we wanted to conquer the world, it just came out in a sketch. 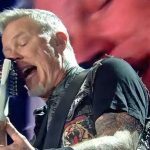 The band also mentioned how their kids feel about Metallica, with guitarist Kirk Hammett says: “My children think that guitar playing is boring. My oldest one plays piano and cello and my eight-year-old plays violin. 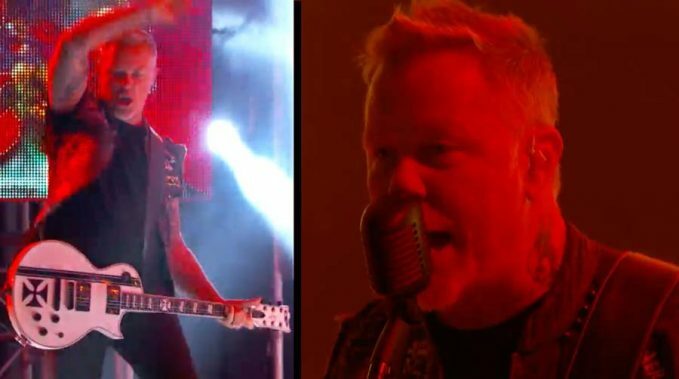 Watch the video footage of the Metallica’s appearance on Jimmy Kimmel Live can be seen below.